Jeri Kitchen, CNM, Holzer OB/GYN Department, shown standing in the photo, recently delivered her 1000th baby. 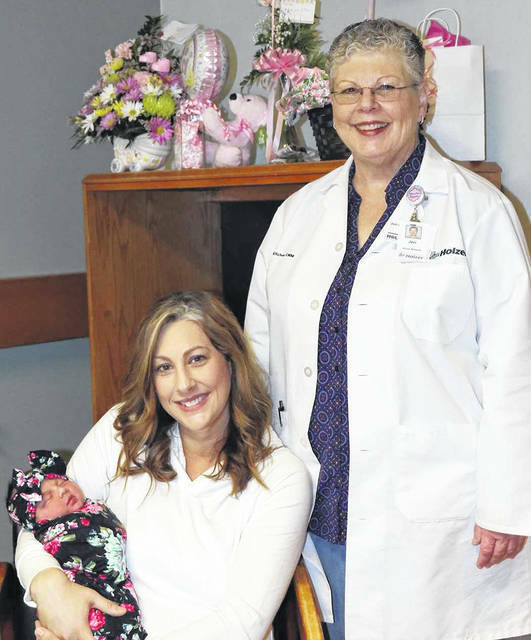 Colbie Blake Smith was born Jan. 31 to parents, Josh and Cassie Smith of Long Bottom, Ohio in Meigs County. She is welcomed home by big brothers Colin and Carter. Kitchen is Board Certified by the American Midwifery Certification Board and sees patients at Holzer locations in Pomeroy and Gallipolis. “It is a privilege to provide the best care possible for our patients,” Kitchen said.